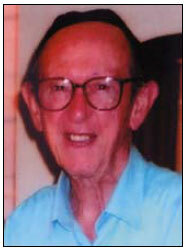 Ferdie Stern passed away peacefully in Durban on 1 June 2010 in his 91st year, a victim of hairy cell leukaemia. His parents, Simon and Bertha, had emigrated from a small village, Rohatten, in Austria and settled in Dordrecht in the Eastern Cape where they farmed. His father became mayor, but unfortunately died when Ferdie was only 8 years old. Ferdie was one of 7 children. His mother moved to Cape Town and managed to give all her children a university education. Ferdie completed his schooling at Rondebosch High School, where he developed a love for cricket and eventually represented Western Province as a spin bowler. He studied medicine at the University of Cape Town, graduating in 1941. He served his internship at Greys Hospital, where he met a nursing sister Margaret, who would eventually become his wife. In 1943 he joined the armed forces and became a medical officer on the troop ships that plied between Egypt and India. His first child Ann was born in 1945. Ferdie and Margaret had another daughter Jenny and a son David. After the war he and his family went to the UK, where he continued his medical studies. He obtained a Diploma in Child Health at the Royal College of Physicians in London and then an MRCP at Edinburgh in 1948. He returned to South Africa in 1949. Ferdie practised as a family doctor and continued to practise until 6 weeks before his death - a total of 61 years. This must surely be a record. I remember being told by a GP for whom I had done a locum that it took 10 years to build up a practice,10 years to hold it, and then it would slowly die after a further 10 years. He died in harness, which I am sure was his wish. Ferdie was a very special doctor. His patients adored him and remained faithful to him. He moved to a retirement complex in Durban North where most of the residents had been his patients and continued to consult him. He had a special love for paediatrics and never missed a meeting, run by the late Harry Wallace, at Addington Hospital. Over weekends and at night he would visit patients who were hospitalised in the city. Although he never assisted at surgical operations he was very supportive of younger specialists. Many of his patients felt that he was their rock and anchor when there was a medical problem and he was widely recognised as the doyen of the true family doctor. He attended many meetings and remained very much up to date, despite his advanced years. His death has left a great vacuum at his consulting rooms in Broadway, where he practised for 61 years, which will be difficult to fill. In the Jewish context he was a mensch. His funeral at Redhill was attended by a host of former patients and by his loved ones. We extend our deepest sympathy to his children and 8 grandchildren.